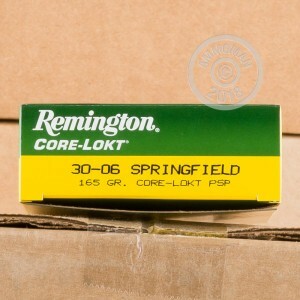 Remington Core-Lokt ammunition has helped countless hunters put venison on the table in the last few decades. This .30-06 Springfield variant will do just that at any range. 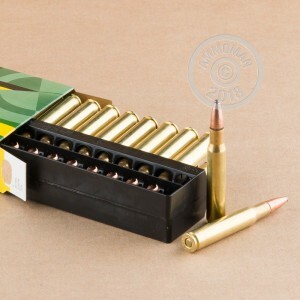 Each cartridge in this box of 20 fires a 165 grain soft point bullet at a muzzle velocity of 2,800 feet per second. Core-Lokt bullets produce reliable mushrooming for effective deer kills at long range thanks to their timeless design, which binds a copper jacket to a lead core for maximum weight retention. 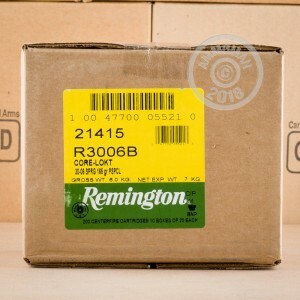 This ammunition is made in Lonoke, Arkansas using non-corrosive Boxer primers and brass cases.